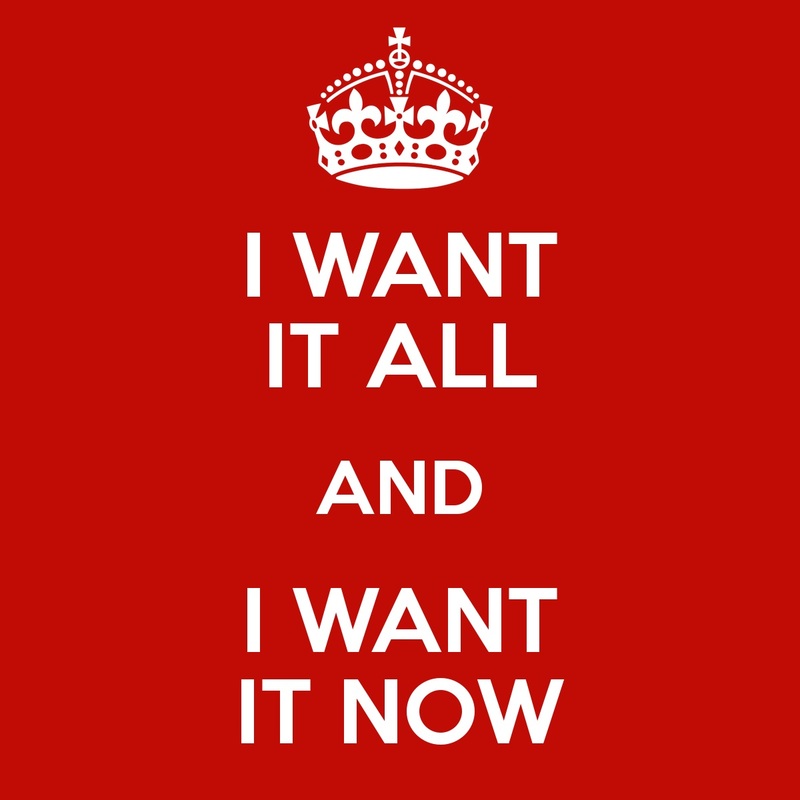 “I want it now!” Does that sound familiar to you? If so, then you are probably from Generation Y or… that other generation that makes fun of Generation Y.
Let’s face it, technology has “shrunk” the world. Nowadays, the access to things is almost unlimited. Therefore, it’s almost “inconceivable” the idea of waiting for things to happen. This type of mindset has of course, repercussions in terms of how we manage our lives. Now be honest… would you want it to be in any other way? Once you have it good, you don’t want to go back. That’s pure human nature. People like or seek things that are convenient. People know what they want and they want it now — instant gratification mindset. Just take a look at the examples below. Nowadays, it’s okay if you don’t know how to cook. Just go to the supermarket and you’ll find an endless array of prepared food. Feeling too lazy to do anything in the kitchen? There is always the option of eating out. Don’t want to wait for a hot meal? There are endless fast-food chain options. You see what’s happening here? It’s all about convenience and businesses know it. But where is this leading us? This might sound like an exaggeration to some, but our eating choices are a reflection of our lifestyle and character. Cooking your own food requires a certain amount of discipline and the willingness to sacrifice something invaluable (time). If you’re a “fast” person, then you’ll probably opt for fast-food options. On the other hand, if you’re a “take it slow” type of person, then you are probably willing to wait to get what you want. That being said, if you don’t sacrifice for what you want, what you want will be the sacrifice. In order to be loved, one must be lovable. However, all people want nowadays is to be loved without putting much effort into it. There is a lot of pride and entitlement but very little compromise. I’m sorry to disappoint, but that is not realistic at all. In order to get something, one needs to give something. Unfortunately, just like their food, fast people also want fast relationships. This is where things can get a little bit dangerous. Sometimes romantic relationship are like companies, we need to invest in them. Remember, no successful company is built overnight. Even when they experience growth, they need to keep innovating in order to stay relevant. And this is exactly what couples sometimes fail to do — keeping it “fresh”. How many times have we heard about companies that experience an enormous growth and then fail to sustain it? What worked last year, might not work this year. This is where the culture of instant gratification is the most evident among the Millennials. Some people are calling Millennials the “Entitled Generation”. Apparently, these individuals expect high salaries right after graduation and fast career progressions. So what’s going in their minds? Well, Millennials did not grow up in tough times like their elders did. They probably had greater access to certain opportunities and privileges than their older counterparts. Which is a good thing right? This is where it gets tricky. In my opinion, Millennials tasted the sweet before they experienced the bitter. What do I mean? Most of them had it “easy” while they were growing up and no one told them that things were going to change drastically (for worse) after they enter adulthood. Therefore, no wonder why they are “entitled”, because if the world economy hadn’t tanked: Millennials would probably be the ones running the world. Think about it… if they are the most educated generation, shouldn’t they be the best paid generation as well? Regardless if it’s good or bad, I believe the “I Want It Now” mindset is going to stay for a while. It’s just too tempting and too difficult not to want it. What do you think?